Abstract: Depression is a very common comorbidity in patients with chronic wounds. At least 30% of those patients suffer from depressive symptoms or anxiety. To measure impairment on daily life, different quality of life (QoL) questionnaires can be used as well as specialized questionnaires to evaluate different levels of depression. In this review, we present some of the current measurement tools and effects of depression on QoL. Depression is often associated with wound duration, odor of wounds, and furthermore with pain and immobility. On the other hand, depression might reduce wound healing itself via psychoimmunological effects. QoL, in general, is reduced in patients with chronic wounds, but especially in the case of pain, immobility and older age, and sometimes independent to wound status (healed or active). Treating medical and health care personnel should establish depression and QoL questionnaires in daily practice and should consider the psychological health of their patients as part of their treatment. Anxiety in daily life is a transitory condition of fear or nervousness, normally caused by stress-inducing events. But sometimes, anxiety can be more like a trait of a person. In this case, it is a chronic condition characterized by habitual patterns of behavior (e.g., limitation of normal social activities and interactions), thoughts, and emotions. Anxiety also can be part of anxiety disorders that can cause an excessive and persistent sense of apprehension, with physical symptoms such as sweating, palpitations, and feelings of stress or sleeping disorders. Depression and anxiety, both, can impair patient’s quality of life (QoL), especially when chronic diseases appear. Chronic wounds are defined as loss of skin integrity with 1 or more underlying structures and absent healing within 8 weeks.2 Patients with chronic wounds very often report feelings of losing self-control in their daily life by external care for their chronic wound,3 and most patients are pessimistic concerning their future and healing of their wound.3 In some cases, those feelings can exceed a normal range.4 To make those feelings more concrete, it is useful to measure them with questionnaires. For other chronic dermatosis, for example, psoriasis, it is already well accepted that the affected patients have significant impairments in their everyday life5,6 that can be measured by using the Dermatology Quality of Life-questionnaire (DLQI).7 However, for chronic wound patients, more specific questionnaires are needed, and furthermore, it is necessary to record additional problems associated with the wound, like wound secretion, odor, pain or mobility of patients. Assessing patient’s psycho-social situation can lead to more effective therapeutic strategies tailored to the particular needs of the patient. Therefore, specific questionnaires for measuring QoL and depressive symptoms (Box 1) are available. Abbreviations: QoL, quality of life; NRS, numeric rating scale; VAS, Visual Analogue Scale. In the following, we present an overview of different questionnaires and discuss their use to measure and report the physical and mental impact of chronic wounds on patients (Table 1). Abbreviations: PDFS, Pain depression fatigue sleep; MOS, medical outcomes study; QoL, quality of life; PSS, perceived stress scale; RIPQ, revised illness perception questionnaire; PHQ-9, Patient Health Questionnaire 9-item; HADS, Hospital Anxiety and Depression Scale; DLQI, Dermatology Quality of Life Index; GDS, Geriatric depression scale; QIDS-SR16, Quick Inventory of Depressive Symptomatology-Self Report (16); BDI, Beck Depression Inventory; NHP, Nottingham Health Profile; HRQoL, health-related QoL; NRS, numeric rating scale; UCLA, University of California, Los Angeles; RSES, Rosenberg self-esteem scale; DFU, diabetic foot ulcer; SF-6, Short Form-6 Survey. The 20 items in the CES-D scale measure symptoms of depression in 9 different groups as defined by the American Psychiatric Association Diagnostic and Statistical Manual. Radloff8 invented the CES-D in 1977, and in 2004 it was revised by Eaton et al.9 The scale is well known and is very often used in the detection of depression in psychiatric patients.10 The CES-D interviews about sadness (dysphoria), loss of interest (anhedonia), appetite, sleep, thinking/concentration, guilt (worthlessness), tiredness (fatigue), movement (agitation), and suicidal ideation. This scale is very specific to detect depressive symptoms but is comprehensive. The CESD-R can be used free for research purposes or in clinical practice. The HADS was developed by Zigmond and Snaith.11 It is a short (14 items) but effective tool for identifying and quantifying anxiety and depression in medical patients with 7 items for each subscale. On purpose, severely psychopathological symptoms are not covered, and there are also no items with possible relation to somatic diseases, to avoid confounding with somatic diseases. This questionnaire contains only few items which might be useful especially in elderly patients with impairments of memory and concentration. The HADS is licensed and a license agreement must be completed before its use. There is also a fee required for all commercial and academic users. This is the specific depression module of the original patient health questionnaire with interrogation of depressive symptoms and functional impairment.12 Major depression is diagnosed if 5 or more of the 9 depressive symptom criteria have been present at least “more than half of the days” in the past 2 weeks, and 1 of the symptoms is depressed mood or anhedonia. The PHQ-9 score can range from 0 to 27, since each of the 9 items can score from 0 (not at all) to 3 (nearly every day). This questionnaire contains only few items which might be useful especially in elderly patients with impairments of memory and concentration. This tool can be used to screen, diagnose, measure and monitor severity of depression. The PHQ and its subscales are free of charge and available for non-commercial use. In publications, there has to be a reference to the original publication. The 16-item QIDS13 was developed to assess the severity of depressive symptoms. The QIDS-SR16 is the self-rated version and covers 9 diagnostic symptom domains. The QIDS assesses all the defined symptoms designated by the American Psychiatry Association Diagnostic and Statistical Manual of Mental Disorders – fourth edition (DSM-IV) (APA 1994) to diagnose a major depressive episode. Normally, the score is used to measure and monitor severity of depressive symptoms (during the course of the disease) but the questionnaire can also be used as a screening tool. The use of the QIDS is free, but any publications involving its use must include an acknowledgment to the University of Texas (UT) Southwestern Medical Center. In addition, all reproduced copies should include their standard copyright notice (© UT Southwestern Medical Center, Dallas, Texas). This is a self-reporting instrument for evaluating global self-worth by measuring both positive and negative feelings about the self.14 Patients have to answer 10 items on a 4-point scale ranging from strongly agree to strongly disagree. The scale was developed in 1965 and has a high reliability. Studies have demonstrated both a unidimensional and a 2-factor (self-confidence and self-deprecation) structure to the scale. Before use, you have to request permission on the University of Maryland Sociology website (www.socy.umd.edu). The DLQI is a 10-item questionnaire that can be divided into 6 dimensions (symptoms and feelings, daily activities, leisure, work and school, personal relationship, and treatment). Higher values correlate with greater impact on QoL. The DLQI can be used for over 33 different (skin) diseases and is available in 32 countries and 55 languages.15 The DLQI may be used for routine clinical use. There is no special permission or charge for its use in this context, but a requirement to reprint a copyright statement on the used DLQI. For academic use, for example, in pharmaceutical studies, there is a charge for the use of the DLQI that depends on the total number of surveyed patients with the DLQI. The Euro-Qol-5D is a standardized descriptive self-administered questionnaire measuring health-related QoL16 that includes a scale of 0 to 100 for the patient’s current health status. The questionnaire contains 5 dimensions (mobility, self-care, daily activities, pain/discomfort, and anxiety/depression). This questionnaire is short and easy to read that might be useful especially in elderly patients with impairments of memory and concentration. To use the EQ-5D, first you have to register your study or project on https://euroqol.org/. The EuroQol Office will then contact you by e-mail and inform you about the terms and conditions that apply to your use of the EQ-5D, including licensing fees (if applicable). The size of the payment depends on the type of study, funding source, sample size and number of requested languages. The Wound-QoL18 is a shortened combination (17 of 92 questions) of the Freiburg Life Quality Assessment for wounds, the Cardiff Wound Impact Schedule,19 and the Würzburg Wound Score.20 The Wound-QoL has 3 subscales, including everyday life, body, and psyche. This scale is licensed but can be provided by several associations (e.g., the ICW/Initiative chronische Wunden) to their members without any charge. The pain VAS is a single-item scale with a unidimensional measure of pain intensity.21 It is a continuous scale with a horizontal line, usually 10 cm (100 mm) in length, connected with the 2 verbal descriptions, with the limits VAS 0=“no pain at all” and VAS 10=“my pain is as bad as it could possibly be”. The score is determined by measuring the distance (mm) on the 10cm line between the “no pain” starting point and the patient’s mark. The pain VAS is available free of charge. Jones et al31 reported about 27% of the surveyed patients with depression and 26% of patients with anxiety, validated by the HADS questionnaire. There was a positive correlation between depression and odor,31,32 but no association with exudate itself, immobility or if patients were living alone. Souza et al33 investigated patients with venous leg ulcers persisting for at least 6 months persistence and identified also 30% with anxiety and 40% with depression by using the HADS questionnaire. They could not find any association for either with gender, age and duration of the disease or for religion or job status. Finlayson et al35 analyzed 247 patients with venous leg ulcers. Thirty-three percent of those patients experienced moderate-to-severe symptoms of pain, depressive symptoms, fatigue, or sleep disturbances. Patients in this subgroup also showed reduced QoL compared with the 67% of patients with mild symptoms. Interestingly, they detected that ulcers of patients with severe symptoms were 1.5 times less likely to heal in the following 24 weeks. Udovichenko et al39 analogously found about 39% patients with depression and 36% with anxiety in a population of patients with diabetic ulcers. Depression and anxiety were found more often in females than in males (48% and 46% vs 27% and 25%, respectively) in the general population. Different individual factors like healing prognosis, diabetes duration, insulin treatment, history of myocardial infarction, history of foot ulcers, and recent foot surgery were not possible risk factors for the development of depression or anxiety. In general, depression was not associated with reduced healing rates, only a summation of those risk factors to a combined score showed significantly more patients with depression than without; as well, patients with severe depression and no former ulcer history showed higher mortality. Similar to venous wounds, Iversen et al40 showed for diabetic wounds that the risk of developing a diabetic foot ulcer was almost 2-fold for patients reporting a HADS score of 8–10, and 3-fold for HADS scores of ≥11, compared with HADS scores of <8, after adjusting for age, gender, and serum glucose at baseline. Symptoms of depression at baseline were associated with an increased risk of developing diabetic foot ulcer in a dose–response manner during this 11-year follow-up. Herber et al3 presented in a review of different publications between 1990 and 2006 that patients with chronic wounds like leg ulcers suffered significantly more often from higher pain levels, functional and social limitations, lower vitality, and have emotional restrictions. Pain sensations reduced significantly the overall health-related QoL of patients with chronic wounds.41 Similar results were presented by Renner et al42 in patients with chronic pain sensations. Patients with higher pain values of ≥5 in the VAS suffered from reduced mean health status compared with patients with lower pain values. Hellström et al43 demonstrated that patients with pain values of ≥5 (on a numeric rating scale) suffered from sleep disturbances, in about 35%. Although more women than men reported pain and scored higher on a numeric rating scale, there were no statistical differences for sleep disturbances between both genders. Arterial and venous-arterial leg ulcers showed higher pain scores and because of this, higher risk of sleep disturbances than other etiologies of leg ulcers. Not only QoL but also depression can be associated with chronic pain, indicating pain as an independent factor for the development of depression.15,31 Also, Zhou and Jia29 described an increased risk for depression in patients with pain vs. no pain related to the wound, at initial examination. They used the PHQ-9 for their survey. In another study, where the health-related QoL, self-esteem, and functional status had been investigated in leg ulcer patients and a control group, significant differences for physical functioning, emotional role, bodily pain, general health, and vitality could be found.44 Kouris et al45 confirmed a significant impairment in QoL, self-esteem, anxiety, and social isolation in a case–control study of leg ulcer patients. Roth et al46 used among others the CES-D questionnaire but could not demonstrate that results for pain assessment were significantly related to results of mood assessment. Only pain catastrophizing, a coping strategy for pain, was significantly related to pain intensity and higher levels of affective distress and depressive symptoms. Not only pain but also limited mobility, age, or further comorbidity reduce QoL of the affected patients.41,47 Hopman et al41 described that male patients with younger age, pain, problems with their mobility, or daily activities, as well as anxiety at their first visit, benefit the most from possible interventions regarding especially their mentally orientated QoL. Vice versa Hopman et al41 concluded that vulnerable subgroups are those with pain, anxiety and depression at first visit. Siersma et al investigated with the Euro-Qol-5D, the 5 domains of daily life activities, self-care items, pain and mobility items, and correlated ulcer-dependent symptoms. They found for most patients that not only immobility but also critical ischemia of a limb, location of the wound, wound size, and diabetes are predisposing factors for the existence of anxiety and depression. Besides this, immobility was one of the most important items in affecting all other domains of the Euro-Qol-5D. Renner et al48 investigated changes in QoL for patients with chronic venous insufficiency (CVI) but without a history of ulceration, active, and healed leg ulcers due to CVI. They demonstrated by using the FLQA-w that in patients with active or healed ulceration pain assessment, physical complaints, and differences in everyday life are mostly age-dependent but not dependent on the status of their leg ulcer. It was obvious that patients with active ulcerations showed significantly more often feelings of unhappiness, but patients with healed ulcers complained significantly more often about exhaustion and asthenia. Both groups with active and healed ulceration differed significantly concerning their psychic/mental conditions from patients without chronic wounds (present or history of). So wound closure might not improve QoL in all patients, especially in elderly patients with additional physical impairments. Also, Zhou and Jia29 found no difference between positive or negative depression screening dependent on wound status (active vs. healed). One important step to detect depression, anxiety or limitation in QoL seems to be the screening with a reliable questionnaire. Some of the presented questionnaires are very short and easy to handle, hence suitable for elderly patients. Others are more detailed but can measure more precisely severity of depression. On the other hand, patients often need assistance in filling out those extensive questionnaires. It is necessary for all health care professionals to establish QoL questionnaires and record wound-related pain on a regular basis in patients with chronic wounds, and if some of those screening questions indicate possible depressive symptoms, specialized questionnaires for depression should be used. Optimal pain treatment is a constant goal. While discussing the results from a QoL questionnaire with the patient, some conclusions can be directly drawn by the wound carer and practical solutions can be found in dialogue with the patient. On the other hand, if patients screen positive for depression or depressive symptoms, they should be advised to see a psychiatrist, psychologist, or at least to an experienced physician in this field. Social support and reducing stress further seems to be important for wound healing and the patient’s QoL. Edwards et al49 focused on analyzing healing rates of venous leg ulcers of patients who were part of a community-based Leg Club vs patients with (nursing) treatment at home. They demonstrated that the attendance at the Leg Club provided a wound-healing benefit for the attending patients. Therefore, social support should be offered in specialized wound care centers to patients with chronic wounds by initiating leg clubs or regular meetings for patient education. It is very important to focus not only on local wound treatment and wound closure but also on patients with no, or only slight chance, of wound healing. Wounds that do not heal are a chronic burden for the affected patients, and also in cases of temporary healing, wounds tend to recur because the underlying disease, for example, CVI is already present. Those patients normally need daily care, and their QoL might be reduced, not only because of problems due to wound treatment but also due to co-morbidity, immobility, or pain. Treating health care personnel should consider the psychological health of their patients as part of their treatment. Wound duration has an influence on developing depressive symptoms, but most of the patients already present a high level of anxiety or depression at an early stage of chronicity of their wounds and might benefit from an early psychological intervention, especially female patients and patients with a higher pain level. Patients can be affected / suffering from anxiety or depression independent of their social surroundings / environment. Some of possible risk factors cannot be changed, such as age or gender. However, anxiety, depression, and pain are parameters that can be influenced very well by the treating health care professional. Also, immobility should be regarded as a relevant variable in this vicious circle and should be optimized as much as possible. We thank Mr Felix Schumacher who provided assistance in preparation of Table 1.
euro.who.int/de [homepage on the Internet]. WHO: Definition einer Depression, Available from: http://www.euro.who.int/de/health-topics/noncommunicable-diseases/pages/news/news/2012/10/depression-in-europe/depression-definition. Accessed September 23, 2017. Ruttermann M, Maier-Hasselmann A, Nink-Grebe B, Burckhardt M. Lokaltherapie chronischer Wunden bei Patienten mit peripherer arterieller Verschlusskrankheit, chronisch-venöser Insuffizienz und Diabetes mellitus. [Local treatment of chronic wounds: in patients with peripheral vascular disease, chronic venous insufficiency, and diabetes]. Dtsch Arztebl Int. 2013;110(3):25–31. Herber OR, Schnepp W, Rieger MA. A systematic review on the impact of leg ulceration on patients’ quality of life. Health Qual Life Outcomes. 2007;5:44. Palfreyman S. Assessing the impact of venous ulceration on quality of life. Nurs Times. 2008;104(41):34–37. Kouris A, Christodoulou C, Efstathiou V, et al. Comparative study of quality of life and psychosocial characteristics in patients with psoriasis and leg ulcers. Wound Repair Regen. 2016;24(2):443–446. Sampogna F, Tabolli S, Abeni D; IDI Multipurpose Psoriasis Research on Vital Experiences (IMPROVE) investigators. Living with psoriasis: prevalence of shame, anger, worry, and problems in daily activities and social life. Acta Derm Venereol. 2012;92(3):299–303. Finlay AY, Khan GK. Dermatology Life Quality Index (DLQI)–a simple practical measure for routine clinical use. Clin Exp Dermatol. 1994;19(3):210–216. Radloff LS. The CES-D scale: a self-report depression scale for research in the general population. Appl Psychol Meas. 1977;1:385–401. Eaton WW, Muntaner C, Smith C, et al. Center for Epidemiologic Studies Depression Scale: Review and revision (CESD and CESD-R). In: Maruish ME, editor. The Use of Psychological Testing for Treatment Planning and Outcomes Assessment 3rd edn. Mahwah: Lawrence Erlbaum Associates; 2004:363–377. Murphy JM. Symptom scales and diagnostic schedules in adult psychiatry. In: Tsuang MT, Tohen M, editors. Textbook in Psychiatric Epidemiology. New York, NY: Wiley-Liss; 2002:273–332. Zigmond AS, Snaith RP. The hospital anxiety and depression scale. Acta Psychiatr Scand. 1983;67:361–370. Kroenke K, Spitzer RL, Williams JB. The PHQ-9: validity of a brief depression severity measure. J Gen Intern Med. 2001;16:606–613. Rosenberg M. Society and the adolescent self-image. Princeton University Press; 1965;148(3671):804. Wachholz PA, Masuda PY, Nascimento DC, Taira CM, Cleto NG. Quality of life profile and correlated factors in chronic leg ulcer patients in the mid-west of Sao Paulo State, Brazil. An Bras Dermatol. 2014;89(1):73–81. Greiner W, Claes C, Busschbach JJ, von der Schulenburg JM. Validating the EQ-5D with time trade off for the German population. Eur J Health Econ. 2005;6(2):124–130. Augustin M, Herberger K, Rustenbach SJ, Schäfer I, Zschocke I, Blome C. Quality of life evaluation in wounds: validation of the Freiburg Life Quality Assessment-wound module, a disease-specific instrument. Int Wound J. 2010;7(6):493–501. 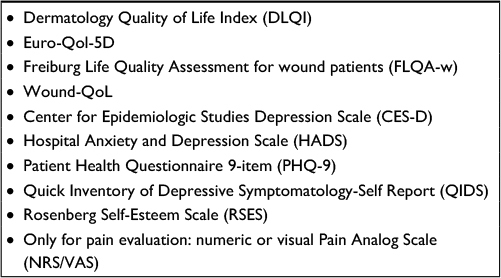 Blome C, Baade K, Debus ES, Price P, Augustin M. The “Wound-QoL”: a short questionnaire measuring quality of life in patients with chronic wounds based on three established disease-specific instruments. Wound Repair Regen. 2014;22(4):504–514. Price P, Harding K. Cardiff Wound Impact Schedule: the development of a condition-specific questionnaire to assess health-related quality of life in patients with chronic wounds of the lower limb. Int Wound J. 2004;1:10–17. Debus ES, Spech E, Larena-Avellaneda A, Faller HH. Lebensqualität bei arteriellen und venösen Ulcera cruris – Einführung eines krankheitsspezifischen Messinstruments. Gefäßchirurgie. 2005;10:99–108. Jensen MP, Karoly P, Braver S. The measurement of clinical pain intensity: a comparison of six methods. Pain. 1986;27:117–126. Busch M, Maske U, Ryl L, Schlack R, Hapke U. [Prevalence of depressive symptoms and diagnosed depression among adults in Germany: results of the German Health Interview and Examination Survey for Adults (DEGS1)]. Bundesgesundheitsblatt. 2013;56(5–6):733–739. German. Henderson AS, Jorm AF, MacKinnon A, et al. The prevalence of depressive disorders and the distribution of depressive symptoms in later life: a survey using Draft ICD-10 and DSM-III-R. Psychol Med. 1993;23:719–729. Henderson AS, Jorm AF, Korten AE, Jacomb P, Christensen H, Rodgers B. Symptoms of depression and anxiety during adult life: evidence for a decline in prevalence with age. Psychol Med. 1998;28(6):1321–1328. Bramesfeld A, Grobe TG, Schwartz FW. Who is diagnosed as suffering from depression in the German statutory health care system? An analysis of health insurance data. Eur J Epidemiol. 2007;22:397–403. Riedel-Heller SG, Matschinger H, Schork A, Angermeyer MC. The utilization of antidepressants in community-dwelling and institutionalized elderly–results form a representative survey in Germany. Pharmacopsychiatry. 2001;34:6–12. Dalgard FJ, Gieler U, Tomas-Aragones L, et al. The psychological burden of skin diseases: a cross-sectional multicenter study among dermatological out-patients in 13 European countries. J Invest Dermatol. 2015;135(4):984–991. Salome GM, Blanes L, Ferreira LM. Assessment of depressive symptoms in people with diabetes mellitus and foot ulcers. Rev Col Bras Cir. 2011;38(5):327–333. Zhou K, Jia P. Depressive symptoms in patients with wounds: a cross-sectional study. Wound Repair Regen. 2016;24:1059–1065. Moffatt CJ, Franks PJ, Doherty DC, Smithdale R, Steptoe A. Psychological factors in leg ulceration: a case-control study. Br J Dermatol. 2009;161(4):750–756. Jones J, Barr W, Robinson J, Carlisle C. Depression in patients with chronic venous ulceration. Br J Nurs. 2006;15(11):S17–S23. Jones JE, Robinson J, Barr W, Carlisle C. Impact of exudate and odor from chronic venous leg ulceration. Nurs Stand. 2008;22(45):53–54, 56, 58. Souza NG, Rodrigues ZC, Miyazaki MC, Pereira de Godoy JM. Venous leg ulcers and emotional consequences. Int J Low Extrem Wounds. 2009; 8(4):194–196. Pereira RC, Santos EF, Queiroz MA, et al. Depression and wellness in elderly patients with venous ulcers. Rev Bras Cir Plast. 2014;29:567–574. Finlayson K, Miaskowski C, Alexander K, et al. Distinct wound healing and quality-of-life outcomes in subgroups of patients with venous leg ulcers with different symptom cluster experiences. J Pain Symptom Manage. 2017;53(5):871–879. Walburn J, Weinman J, Norton S, et al. Stress, illness perceptions, behaviors and healing in venous leg ulcers: findings from a prospective observational study. Psychosom Med. 2017;79(5):585–592. Cole-King A, Harding KG. Psychological factors and delayed healing in chronic wounds. Psychosom Med. 2001;63(2):216–220. Ousey K, Edward KL. Exploring resilience when living with a wound – an integrative literature review. Healthcare (Basel). 2014;2:346–355. Udovichenko OV, Maximova NV, Amosova MV, Yunilaynen OA, Berseneva EA, Starostina EG. Prevalence and prognostic value of depression and anxiety in patients with diabetic foot ulcers and possibilities of their treatment. Curr Diabetes Rev. 2017;13:97–106. Iversen MM, Tell GS, Espehaug B, et al. Is depression a risk factor for diabetic foot ulcers? 11-years follow-up of the Nord-Trondelag Health Study (HUNT). J Diabetes Complications. 2015;29:20–25. Hopman WM, Vandenkerkhof EG, Carley ME, Harrison MB. Health-related quality of life at healing in individuals with chronic venous or mixed-venous leg ulceration: a longitudinal assessment. J Adv Nurs. 2016;72:2869–2878. Renner R, Seikowski K, Simon JC. Association of pain level, health and wound status in patients with chronic leg ulcers. Acta Derm Venereol. 2014;94:50–53. Hellstrom A, Nilsson C, Nilsson A, Fagerström C. Leg ulcers in older people: a national study addressing variation in diagnosis, pain and sleep disturbance. BMC Geriatr. 2016;16:25. Faria E, Blanes L, Hochman B, et al. Health-related quality of life, self-esteem and functional status of patients with leg ulcers. Wounds. 2011;23:4–10. Kouris A, Christodoulou C, Efstathiou V, Chatzimichail I, Zakopoulou N, Zouridaki E. Quality of life in Greek family members living with leg ulcer patients. Wound Repair Regen. 2015;23(5):778–780. Roth RS, Lowery JC, Hamill JB. Assessing persistent pain and its relation to affective distress, depressive symptoms, and pain catastrophizing in patients with chronic wounds: a pilot study. Am J Phys Med Rehabil. 2004;83(11):827–834. Renner R, Gebhardt C, Simon JC, Seikowski K. [Changes in quality of life for patients with chronic venous insufficiency, present or healed leg ulcers]. J Dtsch Dermatol Ges. 2009;7(11):953–961. German. Edwards H, Courtney M, Finlayson K, Lewis C, Lindsay E, Dumble J. Improved healing rates for chronic venous leg ulcers: pilot study results from a randomized controlled trial of a community nursing intervention. Int J Nurs Pract. 2005;11(4):169–176. Finlayson K, Edwards H, Courtney M. The impact of psychosocial factors on adherence to compression therapy to prevent recurrence of venous leg ulcers. J Clin Nurs. 2010 May;19(9–10):1289–97. Hareendran A, Bradbury A, Budd J, Geroulakos G, Hobbs R, Kenkre J, Symonds T. Measuring the impact of venous leg ulcers on quality of life. J Wound Care. 2005 Feb;14(2):53–7. Margolis DJ, Knauss J, Bilker W. Medical conditions associated with venous leg ulcers. Br J Dermatol. 2004 Feb;150(2):267–73.